By: Joseph Jacobs, A. S. Waldstein, Gotthard Deutsch, A. Peiginsky, Peter Wiernik, Herman Rosenthal, Solomon Schechter, Bernhard Friedberg, Executive Committee of the Editorial Board. Polish family of Talmudic scholars that traces its descent from Rashi, on the one side, and from the families of Shor and Samuel Edels on the other. The first Margolioth known was Samuel, dayyan at Posen about 1550; one of his sons, Moses Mordecai, was rabbi at Cracow. The daughter of R. Moses Mordecai married a relative, Mendel Margolioth, rabbi at Przemysl (d. April 2, 1652), and bore him eight sons, all of whom were distinguished Talmudists. 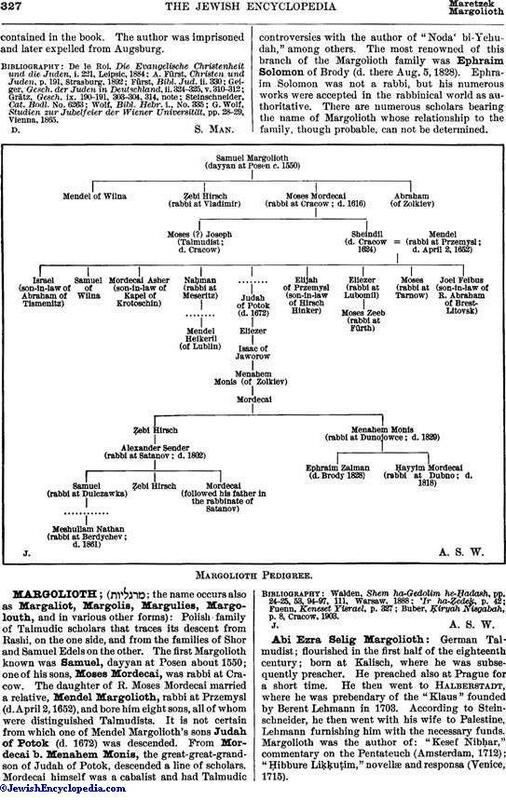 It is not certain from which one of Mendel Margolioth's sons Judah of Potok (d. 1672) was descended. From Mordecai b. Menahem Monis, the great-great-grandson of Judah of Potok, descended a line of scholars. 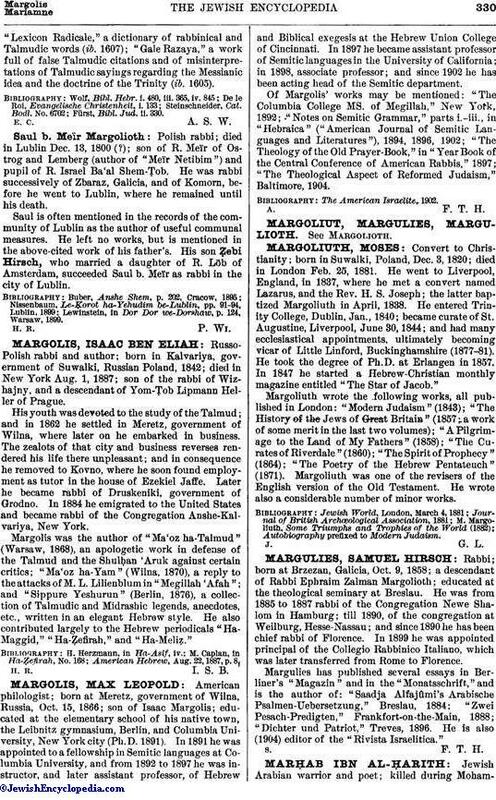 Mordecai himself was a cabalist and had Talmudic controversies with the author of "Noda' bi-Yehudah," among others. 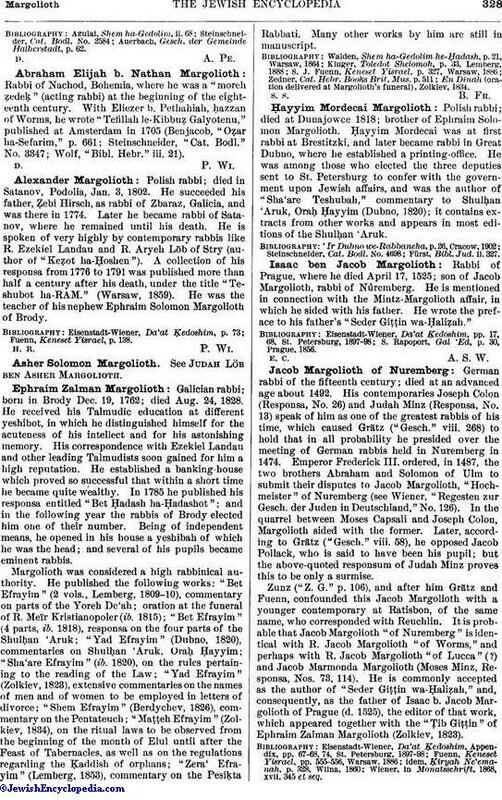 The most renowned of this branch of the Margolioth family was Ephraim Solomon of Brody (d. there Aug. 5, 1828). Ephraim Solomon was not a rabbi, but his numerous works were accepted in the rabbinical world as authoritative. There are numerous scholars bearing the name of Margolioth whose relationship to the family, though probable, can not be determined. Buber, Ḳiryah Nisgabah, p. 8, Cracow, 1903. German Talmudist; flourished in the first half of the eighteenth century; born at Kalisch, where he was subsequently preacher. He preached also at Prague for a short time. He then went to Halberstadt, where he was prebendary of the "Klaus" founded by Berent Lehmann in 1703. According to Steinschneider, he then went with his wife to Palestine, Lehmann furnishing him with the necessary funds. Margolioth was the author of: "Kesef Nibḥar," commentary on the Pentateuch (Amsterdam, 1712); "Ḥibbure Liḳḳuṭim," novellæ and responsa (Venice, 1715). Auerbach, Gesch. der Gemeinde Halberstadt, p. 62. Rabbi of Nachod, Bohemia, where he was a "moreh ẓedeḳ" (acting rabbi) at the beginning of the eighteenth century. With Eliezer b. Pethahiah, ḥazzan of Worms, he wrote "Tefillah le-Kibbuẓ Galyotenu," published at Amsterdam in 1705 (Benjacob, "Oẓar ha-Sefarim," p. 661; Steinschneider, "Cat. Bodl." No. 3347; Wolf, "Bibl. Hebr." iii. 21). Polish rabbi; died in Satanov, Podolia, Jan. 3, 1802. He succeeded his father, Ẓebi Hirsch, as rabbi of Zbaraz, Galicia, and was there in 1774. Later he became rabbi of Satanov, where he remained until his death. He is spoken of very highly by contemporary rabbis like R. Ezekiel Landau and R. Aryeh Löb of Stry (author of "Keẓot ha-Ḥoshen"). A collection of his responsa from 1776 to 1791 was published more than half a century after his death, under the title "Teshubot ha-RAM." (Warsaw, 1859). He was the teacher of his nephew Ephraim Solomon Margolioth of Brody. Fuenn, Keneset Yisrael, p. 138. H. R. P. Wi.Asher Solomon Margolioth. See Judah Löb ben Asher Margolioth. Galician rabbi; born in Brody Dec. 19, 1762; died Aug. 24, 1828. He received his Talmudic education at different yeshibot, in which he distinguished himself for the acuteness of his intellect and for his astonishing memory. His correspondence with Ezekiel Landau and other leading Talmudists soon gained for him a high reputation. He established a banking-house which proved so successful that within a short time he became quite wealthy. In 1785 he published his responsa entitled "Bet Ḥadash ha-Ḥadashot"; and in the following year the rabbis of Brody elected him one of their number. Being of independent means, he opened in his house a yeshibah of which he was the head; and several of his pupils became eminent rabbis. Margolioth was considered a high rabbinical authority. He published the following works: "Bet Efrayim" (2 vols., Lemberg, 1809-10), commentary on parts of the Yoreh De'ah; oration at the funeral of R. Meïr Kristianopoler (ib. 1815); "Bet Efrayim" (4 parts, ib. 1818), responsa on the four parts of the Shulḥan 'Aruk; "Yad Efrayim" (Dubno, 1820), commentaries on Shulḥan 'Aruk, Oraḥ Ḥayyim; "Sha'are Efrayim" (ib. 1820), on the rules pertaining to the reading of the Law; "Yad Efrayim" (Zolkiev, 1823), extensive commentaries on the names of men and of women to be employed in letters of divorce; "Shem Efrayim" (Berdychev, 1826), commentary on the Pentateuch; "Maṭṭeh Efrayim" (Zolkiev, 1834), on the ritual laws to be observed from the beginning of the month of Elul until after the Feast of Tabernacles, as well as on the regulations regarding the Ḳaddish of orphans; "Zera' Efrayim" (Lemberg, 1853), commentary on the Pesiḳta Rabbati. Many other works by him are still in manuscript. En Dinah (oration delivered at Margolioth's funeral), Zolkiev, 1834. Polish rabbi; died at Dunajowce 1818; brother of Ephraim Solomon Margolioth. Ḥayyim Mordecai was at first rabbi at Brestitzki, and later became rabbi in Great Dubno, where he established a printing-office. He was among those who elected the three deputies sent to St. Petersburg to confer with the government upon Jewish affairs, and was the author of "Sha'are Teshubah," commentary to Shulḥan 'Aruk, Oraḥ Ḥayyim (Dubno, 1820); it contains extracts from other works and appears in most editions of the Shulḥan 'Aruk. Fürst, Bibl. Jud. ii. 327. Rabbi of Prague, where he died April 17, 1525; son of Jacob Margolioth, rabbi of Nuremberg. He is mentioned in connection with the Mintz-Margolioth affair, in which he sided with his father. He wrote the preface to his father's "Seder Giṭṭin wa-Ḥaliẓah." S. Rapoport, Gal 'Ed, p. 30, Prague, 1856. German rabbi of the fifteenth century; died at an advanced age about 1492. His contemporaries Joseph Colon (Responsa, No. 26) and Judah Minz (Responsa, No. 13) speak of him as one of the greatest rabbis of his time, which caused Grätz ("Gesch." viii. 268) to hold that in all probability he presided over the meeting of German rabbis held in Nuremberg in 1474. Emperor Frederick III. ordered, in 1487, the two brothers Abraham and Solomon of Ulm to submit their disputes to Jacob Margolioth, "Hochmeister" of Nuremberg (see Wiener, "Regesten zur Gesch. der Juden in Deutschland," No. 126). In the quarrel between Moses Capsali and Joseph Colon, Margolioth sided with the former. Later, according to Grätz ("Gesch." viii. 58), he opposed Jacob Pollack, who is said to have been his pupil; but the above-quoted responsum of Judah Minz proves this to be only a surmise. Zunz ("Z. G." p. 106), and after him Grätz and Fuenn, confounded this Jacob Margolioth with a younger contemporary at Ratisbon, of the same name, who corresponded with Reuchlin. It is probable that Jacob Margolioth "of Nuremberg" is identical with R. Jacob Margolioth "of Worms," and perhaps with R. Jacob Margolioth "of Lucca" (?) and Jacob Marmonda Margolioth (Moses Minz, Responsa, Nos. 73, 114). He is commonly accepted as the author of "Seder Giṭṭin wa-Ḥaliẓah," and, consequently, as the father of Isaac b. Jacob Margolioth of Prague (d. 1525), the editor of that work, which appeared together with the "Ṭib Giṭṭin" of Ephraim Zalman Margolioth (Zolkiev, 1823). Wiener, in Monatsschrift, 1868, xvii. 345 et seq. German rabbi and Hebraist; flourished about 1500. He is known chiefly by a Hebrew letter addressed to Reuchlin, which is preserved in "Epistolæ Clarorum Virorum ad Reuchlinum" (see text in Fuenn, "Keneset Yisrael," pp. 555-556, where he is confounded with Jacob Margolioth, rabbi of Nuremberg). His son, the apostate Antonius Margarita, relates the great services which Jacob rendered his townsmen by interceding in their behalf with Siegmund von Rohrbach, who was imperial governor at Ratisbon from 1499 to 1512 (quoted by Wiener from Margarita's "Der Gantz Jüdisch Glaub," p. 138, Leipsic (1705). According to the same authority this Jacob Margolioth had another son, who was a musician in Prague; this led Wiener to believe that this musician may be identical with R. Isaac b. Jacob Margolioth of Prague (d. 1525), who edited his father's "Seder Giṭṭin wa-Ḥaliẓah" (see Margolioth, Jacob, of Nuremberg); but the supposition seems improbable. Wiener, in Monatsschrift, 1868, xvii. 345 et seq. (where all other sources are quoted and discussed). Polish preacher and moralist of the seventeenth century; died 1673 (?). He came from Vladimir, Volhyṇia, where he was an eye-witness of the massacres of 1648-49, from which he escaped to Germany. He was the author of "Mar'ot Ya'aḳob," tables of ethical rules (Venice, 1662); "Mizbaḥ Ya'aḳob," a sermon on penitence and some haggadic novellæ (ib. 1662); and "Ḳol Ya'aḳob," on the Pentateuch and the Talmud, to which is appended an elegy on the victims of the above-mentioned massacres (Amsterdam, 1708). Lewinstein, in Dor Dor we-Dorshaw, p. 109, Warsaw, 1899. Grandson of R. Mordecai Jaffe; died at Frankfort-on-the-Oder June 14, 1811. He was successively rabbi at Busnow, Szebrszyn, Polotsk, Lesla, and Frankfort-on-the-Oder, and wrote the following works: "Ḳorban Reshit," responsa and discussions on Rosh ha-Shanah (Frankfort-on-the-Oder, 1778); "Peri Tebu'ah," responsa (parts i. and ii., Novidvor, 1796; parts iii. and iv. are still in manuscript); "Ṭal Orot," treatises on the essence of the soul, on immortality, etc. (Frankfort-on-the-Oder, 1751); "Or 'Olam," treatises on natural philosophy, to which is appended Saadia Gaon's commentary on Canticles (ib. 1777); "Bet Middot," on ethics, in prose and verse (Dyhernfurth, 1778); "'Aẓe 'Eden," homilies on belief, philosophy, pride, and humility, with a criticism of Mendelssohn's "Jerusalem" (ib. 1802); "Amirah Ne'imah," on the Haggadah and the Pentateuch (in manuscript); "Iggeret ha-Meliẓah," on style (Novidvor, 1794); "Sefer Ṭob we-Yafeh," collection of poems on dogmatic, grammatical, and liturgical subjects (Frankfort-on-the-Oder, 1770). He was probably the first Judæo-Polish author to write on natural philosophy. Zeitlin, Bibl. Hebr. p. 229. Polish rabbi and author; born probably at Horodenka, Galicia; died at an advanced age at Ostrog, Volhynia, April 24, 1790. He was rabbi of the district of Lemberg for more than forty years (c. 1742-82), at the time when Lemberg had two rabbis, one for the city proper and one for the surrounding district. In 1782 he seems to have gone to Ostrog, where he remained until his death. Margolioth was a pupil of R. Israel Ba'al Shem Ṭob (BEShT), the reputed founder of Ḥasidism, and was probably the greatest Talmudical authority of the time to confess to such discipleship. He was the author of "Meïr Netibim," responsa and novellæ (Polnoi, 1791), "Sod Yakin u-Bo'az," on the Cabala (ib. ), and "Derek ha-Ṭob weha Yashar," on the Shulḥan 'Aruk (Polnoi and Shklov, 1799). 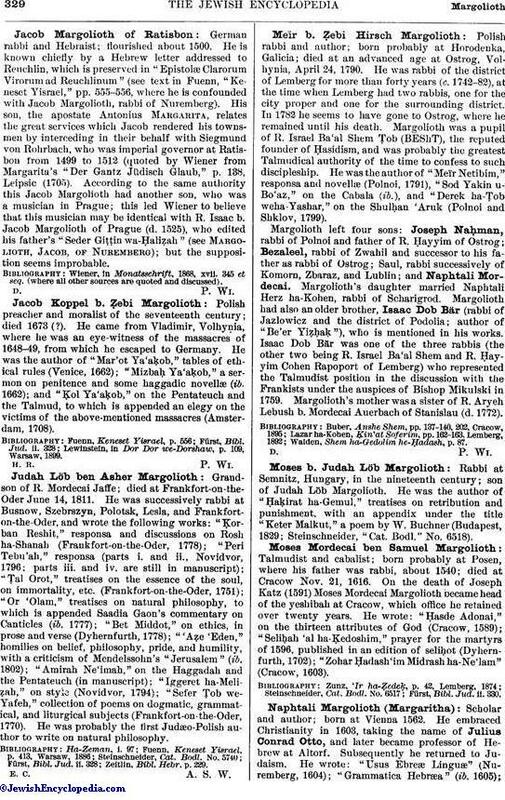 Margolioth left four sons: Joseph Naḥman, rabbi of Polnoi and father of R. Ḥayyim of Ostrog; Bezaleel, rabbi of Zwahil and successor to his father as rabbi of Ostrog; Saul, rabbi successively of Komorn, Zbaraz, and Lublin; and Naphtali Mordecai. Margolioth's daughter married Naphtali Herz ha-Kohen, rabbi of Scharigrod. Margolioth had also an older brother, Isaac Dob Bär (rabbi of Jazlowicz and the district of Podolia; author of "Be'er Yiẓḥaḳ"), who is mentioned in his works. Isaac Dob Bär was one of the three rabbis (the other two being R. Israel Ba'al Shem and R. Ḥayyim Cohen Rapoport of Lemberg) who represented the Talmudist position in the discussion with the Frankists under the auspices of Bishop Mikulski in 1759. 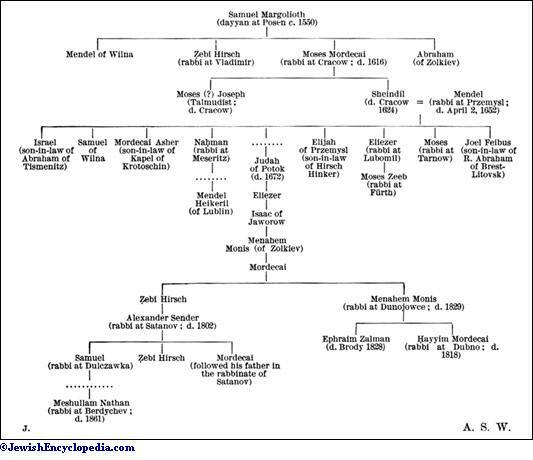 Margolioth's mother was a sister of R. Aryeh Lebush b. Mordecai Auerbach of Stanislau (d. 1772). Walden, Shem ha-Gedolim he-Ḥadash, p. 87. Rabbi at Semnitz, Hungary, in the nineteenth century; son of Judah Löb Margolioth. He was the author of "Ḥaḳirat ha-Gemul," treatises on retribution and punishment, with an appendix under the title "Keter Malkut," a poem by W. Buchner (Budapest, 1829; Steinschneider, "Cat. Bodl." No. 6518). Talmudist and cabalist; born probably at Posen, where his father was rabbi, about 1540; died at Cracow Nov. 21, 1616. On the death of Joseph Katz (1591) Moses Mordecai Margolioth became head of the yeshibah at Cracow, which office he retained over twenty years. He wrote: "Ḥasde Adonai," on the thirteen attributes of God (Cracow, 1589); "Seliḥah 'al ha-Ḳedoshim," prayer for the martyrs of 1596, published in an edition of seliḥot (Dyhernfurth, 1702); "Zohar Ḥadash'im Midrash ha-Ne'lam" (Cracow, 1603). Fürst, Bibl. Jud. ii. 330. Scholar and author; born at Vienna 1562. He embraced Christianity in 1603, taking the name of Julius Conrad Otto, and later became professor of Hebrew at Altorf. Subsequently he returned to Judaism. He wrote: "Usus Ebreæ Linguæ" (Nuremberg, 1604); "Grammatica Hebræa" (ib. 1605);"Lexicon Radicale," a dictionary of rabbinical and Talmudic words (ib. 1607); "Gale Razaya," a work full of false Talmudic citations and of misinterpretations of Talmudic sayings regarding the Messianic idea and the doctrine of the Trinity (ib. 1605). Polish rabbi; died in Lublin Dec. 13, 1800 (? ); son of R. Meïr of Ostrog and Lemberg (author of "Meïr Netibim") and pupil of R. Israel Ba'al Shem-Ṭob. He was rabbi successively of Zbaraz, Galicia, and of Komorn, before he went to Lublin, where he remained until his death. Saul is often mentioned in the records of the community of Lublin as the author of useful communal measures. He left no works, but is mentioned in the above-cited work of his father's. His son Ẓebi Hirsch, who married a daughter of R. Löb of Amsterdam, succeeded Saul b. Meïr as rabbi in the city of Lublin. Lewinstein, in Dor Dor we-Dorshaw, p. 124, Warsaw, 1899.